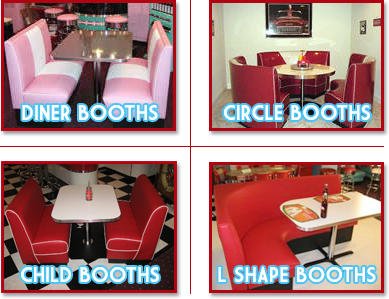 Diner Booths are a fantastic option when it comes to seating in any room. Whether you are decorating a restaurant, diner, kitchen, game room, office, or home theater we can find the right booth option for you. We have been selling diner booth sets for over 15 years and we have the expertise to get you just what you are looking for. Take a look over our website and you will find some of the best photos of custom booths found anywhere in the world. The options on our booth sets are endless. Your options include but are not limited to half circle, circle, modular, L shape, and corner models. Since most of our booths are custom made we can cover them in just about any fabric you can think of. This includes the very retro zodiac and cracked ice fabrics. With every set we sell we also include a table that built just the right size for the booth. These tables are commercial quality and can be done in just about any laminate style or color including the every popular boomerang and cracked ice laminates. Plus all of our tables have real metal table edging, not plastic Mylar like some other companies use. If you are interested in having us build your ultimate diner booth send us an email or give us a call. We look forward to talking to you!